Memory Archivi - ESI S.p.A. - ESI S.p.A.
Loss of memory and lack of concentration are linked to phenomena associated with poor cerebral microcirculation. Nature helps us in these cases, thanks to the benefits brought by Ginkgo Biloba, which contains the flavonol glycosides, useful to help the microcirculation. 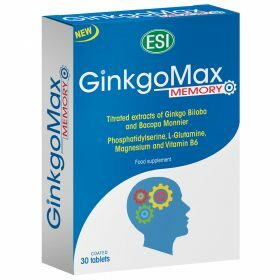 Ginkgomax Memory is a food supplement based on components that are useful to enhance memory and cognitive functions, to reduce tiredness and fatigue, to help the normal functioning of the nervous system and normal energy metabolism. It contains Ginkgo Biloba and Bacopa Monnieri which help memory and cognitive functions, Magnesium and Vitamin B6 which promote the normal nervous functions and reduce tiredness and fatigue; with Glutamine and Phosphatidylserine.